The central component of the Nova8800XL is the precision machined pressure vessel designed to accommodate pressures from sub-critical levels to 2,000 psi and temperatures ranging from ambient to 100°C. The vessel is designed, constructed and certified to the American Society of Mechanical Engineers (ASME) codes. The Nova8800XL vessel and head are manufactured from 316 Stainless Steel with vessel dimensions of 16 inches (diameter) by 30.25 inches (deep). The vessel volume is approximately 27 gallons (100 L). The retaining rings are a plated steel alloy and split in 2 symmetrical halves. The vessel head seal is specifically designed to accommodate the pressures and chemicals used in all NovaSterilis processes. The system is designed to accommodate hundreds of leak proof operations. 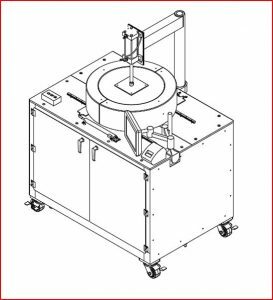 The stirring system is programmed to operate at a broad range of speeds to meet the application requirements. The system is designed to automatically re-engage the stirrer in the event it senses disengagement to insure uninterrupted operation. Internal operating temperatures are monitored directly in real-time. The real-time temperature is displayed on the touch screen monitor whenever the system power is on. Heaters maintain temperatures as measured by the unit’s thermocouple across a broad range of operating temperatures. The heaters are programmed to avoid operation below approximately 10°C unless specially programmed and can operate in the full on, full off or percent on modes for maximum operating flexibility. Vessel pressure is monitored through redundant pressure sensors to ensure the validity of the pressure. The current vessel pressure is displayed on the touch screen monitor whenever the system is power is on. The pressure monitoring system is accurate to better than 1% of expected operating range. The Nova8800XL is designed to be installed indoors in a well ventilated area. Ambient air conditions should remain between 59 to 86°F (15 to 30°C) and relative humidity not expected to exceed 80% (non-condensing). Acceptable geographic altitudes are from 0 to 6,550 feet (0 to 2000 meters). The installed unit weighs approximately 2,200 pounds. The weight is distributed over 4 legs and wheels. Compressed air is used to operate the pneumatic system. Compressed nitrogen may be substituted if necessary. The source should be filtered and the filter should be located immediately upstream of the unit. A reliable source of CO2 is critical for proper operation of the NovaSterilis equipment and processes. Temperatures for CO2 storage should be such that the CO2remains in a liquid state. Tanks shall be of the siphon type. Alternative CO2 supply configurations should be reviewed with NovaSterilis prior to implementation. NovaSterilis support services are available to arrange for CO2 supply. The customer’s facility shall install a means to adequately vent the CO2. Never attempt to operate the unit without adequate CO2 exhaust venting. Preventive Maintenance should be performed by an authorized NovaSterilis service technician under a NovaSterilis factory service contract (details available upon request).